He lives in a shopping mall — but there's a much better home ready to take him. 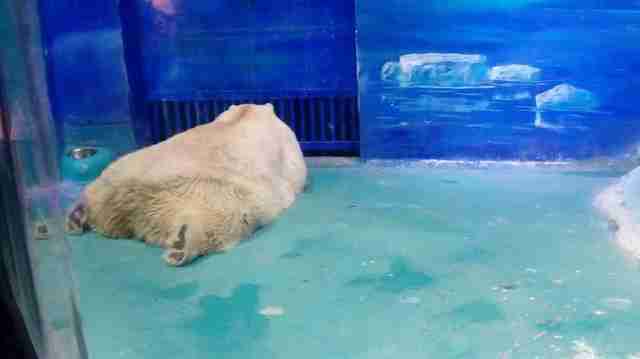 For nearly a year, this polar bear has been known as the saddest bear in the world. But now there's a glimmer of hope. 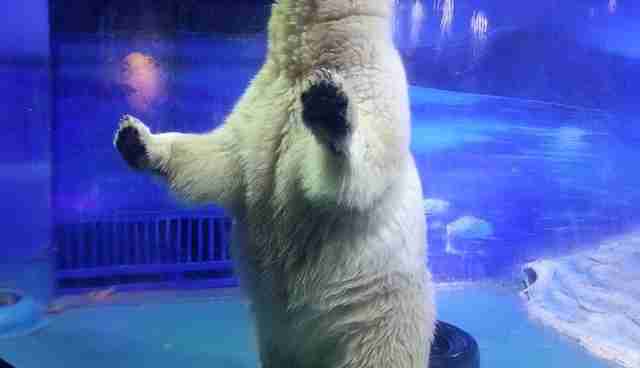 The bear, named Pizza, is the so-called star attraction at Grandview Aquarium, a subpar "zoo" located inside a mall in Guangzhou, China. Pizza's plight came to light early this year, when Animals Asia revealed that the zoo was home to dozens of animals, most of whom were packed into tiny concrete cells devoid of enrichment and sunlight. In addition to Pizza, the zoo has homed wolves, Arctic foxes, walruses, a whale shark and belugas, who do notoriously poorly in captivity. And none of them are thriving - an investigation by the Guangzhou Ocean and Fishery Bureau earlier this year found that animals were injured and died when being transported to the aquarium for its January opening. But few animals captured the public's sympathies like Pizza, who was relegated to a sunless glass-windowed room with only a tiny pool to swim in. While there were originally believed to be two bears located at Grandview, it's unclear if Pizza is the sole survivor, or if he is in addition to those original bears. 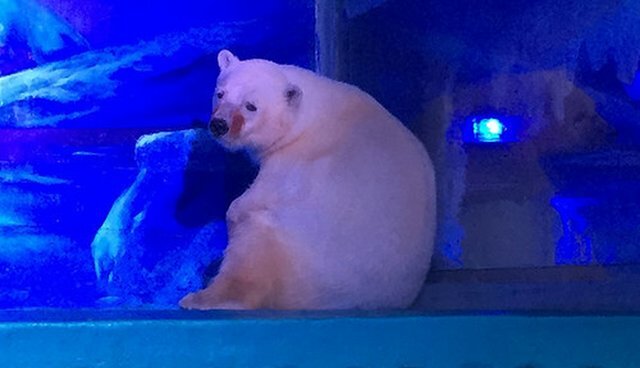 In a video that quickly went viral, one of the bears, believed to be Pizza, lies on his side inside his oppressive blue tank, staring listlessly as throngs of tourists set off camera flashes in his face. "Nowhere to hide from people taking photos - banging on the windows and shouting," Animals Asia wrote about the bear's exhibit. "Nothing natural, no attempt to create an environment that would meet the needs of any living bear - never mind this vast magnificent animal." The video sparked a wave of international public outcry. One petition calling for his release garnered more than 500,000 signatures. And Animals Asia representatives have spent the past several months trying to work with Grandview Aquarium to improve the animals' welfare, even meeting with the facility's representatives. Grandview officials have largely refused to budge. But now, there might be a hint of brightness in Pizza's future. Yorkshire Wildlife Park, a facility in Doncaster, England, has offered a new home to Pizza if Grandview agrees to give him up, Animals Asia announced on Monday. 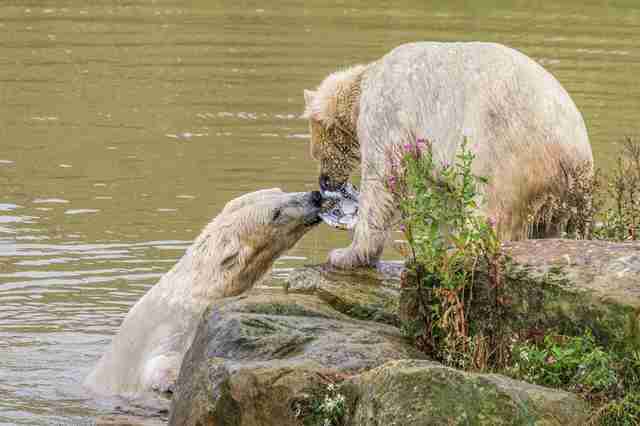 Unfortunately, Yorkshire Wildlife Park is still a zoo, not a sanctuary. 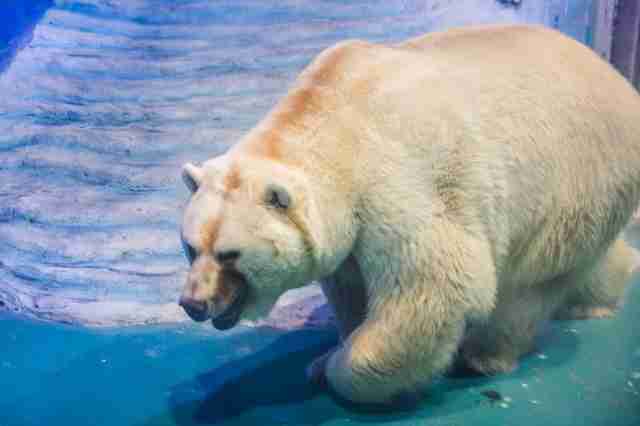 But the park hosts a polar bear habitat that includes 10 acres of land and two lakes, a far cry from the dark room where Pizza, who is too accustomed to captivity to be returned to the wild, is currently kept. "The good news now for Grandview is that they now have the chance to put their mistake right," David Neale, animal welfare director for Animals Asia, said in a statement. "There can be a happy ending and the negative publicity they have suffered can yet be turned into a positive news story. From talking to them I know they know that mistakes have been made in terms of their animal facilities and ongoing care." Of course, the move is far from a certainty. Grandview would have to agree to release Pizza, and not to replace the bear with any similar animals. But Animals Asia is hoping that, with continued public support, Grandview could be pressured into doing the right thing for at least one of its inmates. "No payment has been offered for the bear himself - with the fear that any funds could be used to buy more animals," Animals Asia said. "However, it is hoped that positive headlines could prove to be priceless for Grandview following months of negative publicity. The cost of transferring the bear will be raised if the offer is accepted." And right now, any ray of hope is an improvement over Pizza's current state - especially the hope that he could one day see the sun again. Would you like to help Pizza - and the other animals at Grandview Aquarium - find a real home? You can sign a petition here calling on Grandview to close its doors. You can also donate to Animals Asia to help the group continue its fight to save the Grandview animals, and others in similar situations.